Holidays live in the past as much as in the present. The High Holidays bring a mixed bag of emotions for me. The season has always carried with it a subterranean unsettled feeling. Growing up, we were barely a generation away from the Eastern Europe “Fiddler-on-the-Roof”-Russian/Polish-Ashkenazi-Jewish experience that continued to live on vividly in our own young lives in the form of the elders of our big, Jewish cooperative neighborhood. But comparisons to the shtetls of Eastern Europe cease there. There were no men with sidecurls, tsitsis (fringes) and long black coats on our streets. Yet, who among us had a grandparent without a heavy Yiddish accent? Impossible to imagine! Mom’s parents, and many of their crowd who formed the community in which we lived, had thrown away religion as shackles that kept them oppressed. They were modern, progressive, labor-supporting humanists. My mother professed herself to be an atheist, with the Holocaust as her ultimate proof. But Mom was a fiercely committed Jew. She practiced a highly-refined brand of Culinary Judaism blended with a secular observance that merged our rich Yiddish-influenced environment with a big dose of pro-Israel activism. She was committed to our Jewish identity as a people and a culture, and she maintained an uneasy truce with the religious aspects from a safe distance. Every now and then, we got a smattering of religion thanks to the fact that the only synagogue in our area was Orthodox, so if there was a bar mitzvah in the circle of friends, it was going to be under the aegis of the fire-and-brimstone-leaning Rabbi Sodden. Dad, on the other hand, had served some time in cheder, and had a more religious inclination, although it wasn’t much expressed. Except for at one time of year: The High Holidays. This, I realized, was the Season-of-Mom’s-Discontent. The September holidays weren’t at all like Chanukah for her, with its child-centered celebrations happily observed—awash in presents, candles and oil-infused latkes. And they weren’t like Passover, either; Passover, with its dramatic story of the Exodus—and with a dinner that took a month to prepare; relatives joining from near and far at a table that reached from one end of our Bronx apartment to the other—had the same importance to Mom that Christmas has for Christians. But these Days of Awe—it seems there was no escaping the fact that they were days of Awe about one’s relationship to God. It was a temple holiday, or more properly, a synagogue holiday. And we didn’t go to synagogue. Except, Dad usually made his way to the shule during the holidays, and, mindful of the fact that he was not a regular, he would stand in the very back of the sanctuary that had its folding doors rolled back to accommodate the crowd. Our erev Rosh Hashonah ritual consisted of mom preparing a big dinner, set out on the white tablecloth reserved for Shabbes (yes, we observed Friday night as a special dinner/family time). She would then periodically go to the window where she would watch impatiently for the sight of people coming back from the shule. Often there was an air of annoyance or impatience, one I can now well appreciate, as she had four hungry children to keep occupied, holding them off till Daddy got home. In New York City, at some point long after these memories, the Board of Ed decided to close the schools for the Jewish holidays. Mom, a NYC teacher at that point, remarked that so many of the teachers of that era were Jewish, they really didn’t have the option to stay open with that many teachers out. But when we were young kids, the schools were open on the High Holy Days, and we, like all the Jewish children, stayed home. There was no school for us, but no playing around either. We got into our dress clothes and walked around the neighborhood to visit our grandmothers. When I asked once why we couldn’t go to the park, my mom uneasily stated that if you weren’t in school, you were supposed to be in shule, and so she did not want us to be cavorting in the playground. This, then, was her show of respect. We dressed up, visited both our grandmothers, and waited for school hours to be over to be released to play. The message, she repeated often, was that religious or not, if you did not respect your own holidays, certainly no one else was going to. A few times in my memory, Dad took us to the synagogue, perhaps at the end of Yom Kippur, for the last few moments of the service, to hear the final blast of the shofar. Since it was an orthodox shule, my going required my mother’s presence, in order for me to stand with her on the women’s side. I felt her impatience with a service all in Hebrew, her general discomfiture, her feeling out-of-place. I remember her turning to me and saying “that’s Adon Olam” (the song/prayer)—“it means that it’s almost over” she said with a sigh of relief, both that the service was ending and that she had at last understood something in all that Hebrew. Obviously, I was very sensitive to my mother’s signals. There was one place among the High Holiday observances where Mom conveyed a different sort of tolerance for the worship at the synagogue. It was when Dad would go for the afternoon Yizkor (memorial) service, in memory of his parents and his brother and sister-in-law. Mom did not accompany him; her memorials were in the candles she lit on that occasion, but there was a different sort of understanding in her voice when she referred to that. We did not go with Dad for that either, because in Orthodox practice, you did not go to Yizkor if your parents were alive. As time went on I married, and with my husband, I joined a Reform temple. There, High Holidays were a family affair, with men, women and children seated together. It was a whole different atmosphere, with new music and new styles of worship. There were many years of enjoying that familial experience. But after my divorce, the suburban family temple no longer felt like home, and as my spiritual life shifted, many aspects of that environment no longer spoke to me in quite the same way. Every year I question whether I want to go to a service or not. Some years I do, some years I don’t. I laugh now, that it appears that in this area, I have inherited some of my mom’s ambivalence around this particular holiday, or perhaps around traditional observance of it. I’m hardly alone. 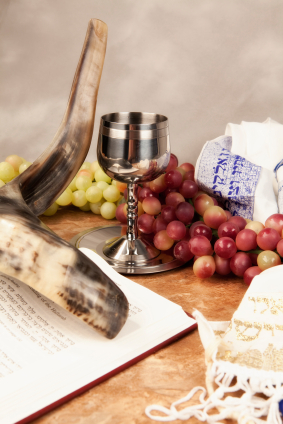 Ask any non-orthodox Jewish person if they are fasting on Yom Kippur and watch the dance begin. I didn’t go to a service this Rosh Hashonah. I didn’t have a round challah, or dip apples in honey, or even spend time with my siblings. But more importantly, I am aware of what this holiday represents: a time to review your life; to make amends, to complete the past, to start anew. This year, Rosh Hashonah was an internal affair. Next year? Who knows? This entry was posted in Memoir, Poignant Moments, Spiritual Reflections, Spirituality, Stories from the Journey and tagged Dad. Jewish, High Holidays, memories, Mom, Rosh Hashonah.